By any metric, www.ucmp.berkeley.edu is a smashing success. 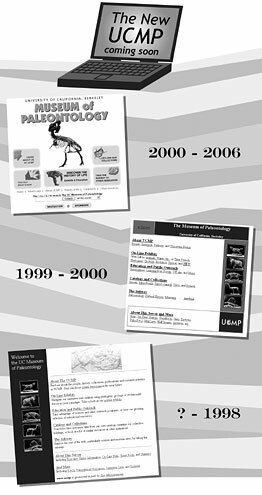 Since the initial fateful upload back in 1993 (essentially the Precambrian of the World Wide Web), the UCMP website has accumulated a devoted audience, critical recognition, choice search engine placement, and a wealth of useful content. Many dedicated members of the UCMP community have worked hard to make the website what it is today. It now receives over four million page requests per month, and is the best online source of information on many topics. So, are we satisfied? No! Of course not. Sure, we could sit back and coast on our storied past, but the truth is that it takes work to stay on top. With this in mind, we have embarked on an ambitious website overhaul project. Elements of this project include improved navigation and user interface, a graphical makeover, a modernized technological infrastructure, a site-wide information audit, and new content features. Users will be able to experience the UCMP like never before, with podcasts, web-cams, and profiles of the exciting research happening at the museum. It is a colossal undertaking that will require the participation of the entire UCMP community. overhaul of the UCMP site by making a contribution toward the effort. All donors will be listed on the website. Simply fill out the Friends of UCMP form and indicate that you would like to support our website improvement project. Work has already begun, so keep your eyes on www.ucmp.berkeley.edu, and expect to see some big changes in 2006.